Updated Monday October 1, 2018 by Tim Dodge. Description: This Sparrows Point tradition for over 30 years is for HALLOWEEN lovers everywhere. Victims from as far as Pennsylvania, Virginia and West Virginia have travelled to experience the fright and terror of 'The Dungeons'. Enjoy the 1 hour tour that includes a walk through the terrifying woods of the Fort Howard county park, and the infamous fort dungeons, haunted since the historical battle of 1812, where the likes of Michael Myers, Freddy Krueger and Hannibal Lector await your presence. Do you like clowns? Enjoy food, drinks and our famous hot chocolate for a night fit for the entire family. Come early and bring your Halloween-spirit for some fun and fright at the Edgemere-Sparrows Point Haunted Dungeons! Waiting areas and bypass points are provided for families with children too young to experience the Dungeons. Program operation subject to weather. 'Kids Trick-or-Treat Night' (last Saturday of operation) invites our little friends to the park for a guided tour from our not-so-scary hosts. Best part, IT'S FREE!!!! Bring a bag and your best costume! 'County Employee Appreciation Night' invites all of our county employees (teachers, police, fire-fighters, etc...) to attend our event at a discounted price! No Refund Warning: Your admission ticket is non-refundable at the time of purchase. No refunds will be given under any circumstances! No readmission will be granted without purchasing a new ticket. Special Effects Warning: Please be aware that the following effects are used throughout the park: Strobe lighting and other disorienting lighting, fog machines, extreme darkness, intense sounds, claustrophobic spaces, damp and wet conditions, uneven terrain and flooring, narrow passageways and steps, extreme visual effects (including graphic imagery and gore), as well as performer and mechanical driven scares. Health Warning: You should not enter if you suffer from claustrophobia, heart issues, back or neck ailments, respiratory issues, are pregnant, are prone to epileptic seizures, or have any other physical or mental limitations that will impair your ability to experience these attractions. Assumption of Risk: Our attractions are built by volunteers and are mostly constructed of recycled appliances, pallets, iron, steel, and other sometimes filthy materials we have acquired from various sources. Please follow instructions and all rules to help ensure that you stay as safe as possible throughout the park. Although safety measures have been taken, our park may not be appropriate for everyone. Children Warning: Children of all ages are welcome but please understand that some of the attractions may scar your child for life. Children must be accompanied by an adult at all times. Chicken Warning: If you are absolutely terrified at any point during your tour of the park, Chicken Exits are available throughout the park. Once you elect to leave the park, no refund will be given and readmission will not be granted without purchasing a new ticket. Lost/Stolen/Damaged Property Warning: Due to the nature of our attractions, we recommend not carrying any loose or valuable items into the park. If you must bring personal property into the park, please do so at your own risk. We are not responsible for lost, stolen, or damaged personal property. Enter at your own risk. 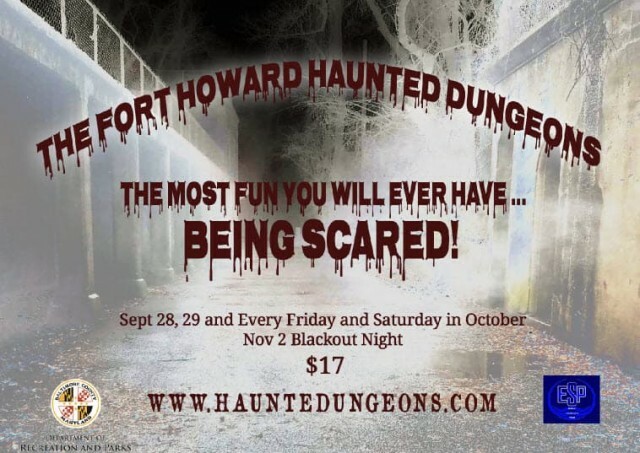 In consideration and acceptance of admission to the Haunted Dungeons, guests agree to release its operators, affiliates, employees, volunteers, contractors, Baltimore County Department of Recreation and Parks, Edgemere-Sparrows Point Recreational Council, and other patrons harmless from any and all legal liability, property damage, and medical liability due to harm, injury, death, or expense and all visitors personally assume all risks from any and all of their actions including but not limited to negligent acts and/or strict liability acts. Guests may not bring weapons or any items that could harm others into the park. Guests may not bring alcohol or illegal drugs into the park. Guests may not be intoxicated or on mind-altering drugs when entering the park. Guests must not hit, poke, taunt, or disrupt our actors or other volunteers. Guests must stay with their group and follow all volunteer's instructions throughout park. These rules are intended to protect all visitors to the park as well as all volunteers at the park. Please understand that some of our actors are not of a legal age. Your bad behaviors in front of them will not be tolerated. Visitors of the park, who we deem to violate any of the above rules and/or as being abusive in any way to volunteers or other visitors will be escorted out immediately, will not be given a refund, and will not be allowed reentry. Legal action against disruptive guests may be taken. Thank you very much for your Co-operation and your Patronage.